A new, fixed width WordPress theme with 2 columns. It is widget ready and has an options page. Changing the header image is easy, in case you don’t like Willy. @Admin How can I get this theme. can you send me the link. Where on the stylesheet do I change the background (currently grey)? Please help – I have been working on this for hours with no luck. I would like to change the grey color on the left and right sides of the body. Ideally I would like to change it to a custom background with some sort of whimsical pattern. Is this possible? Using 1.0.5… I cannot get text to wrap at all, using any feature of the editor or even `align=”right”`inserted into the image tag. Is there something missing in the CSS or something preventing the text from wrapping? I have not been able to figure this one out! The auto-float was in version 1.0 but is gone in version 1.05.
i tried to install this theme, and realised that there’s an auto text-wrap feature which causes the alignments of my photos and captions to go crazy. can i remove that? 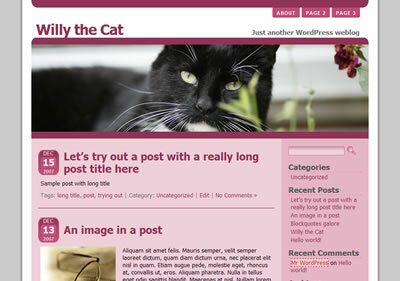 YOUR OWN HEADER IMAGE HOW-TO: Upload a “headerimage.jpg” (rename your image to that name) to the directory “/wp-content/themes/willythecat/images/” in the wordpress installation directory on your web hosting account. Delete (or rename) the exisiting “headerimage.jpg” in that directory first if your FTP software won’t let you overwrite it. The “headerimage.jpg” must be 740 pixels wide and 35 pixels tall AT LEAST (it can be wider and taller – no problem). The visible width of the image will always be 740 pixels but you can set (on the options page) which part to show (left, right, center…) if the image is wider than 740 pixels. In case you have not used a FTP software (“FTP client”) yet, click here. I love the theme but I do need to take willy out. Where do I do that at? I am pretty tech challenged. I’ve been into the theme but I don’t see where the new image should go. Also any idea why my bookmarklets are in a long single line down the post? They didn’t used to do that so I’m curious if it’s something I can fix. Otherwise, thanks! I love the design and colors, I just need to put my header back in. @ Dickie: Unfortunately, that would require quite a few changes, rather a complete rewrite. I will make the header image clickable by default in the next update, which should be online within a few weeks. I was wondering if there was a way to make the headerimage.jpg clickable for the “home”. Just wanted to thank you for this wonderful theme. Everyone at Furrever Friends Rescue loves Willy! We needed a blog quick and this theme made it possible. Hi I am having a strange problem. The index page of my wordpress journal doesnt have at the bottom later entries. This only happens when I put in the willy the cat tempate. Is this the way it’s made? It doesn’t let me navigate back on the index page but it does on other ones. Please advise. Thanks!